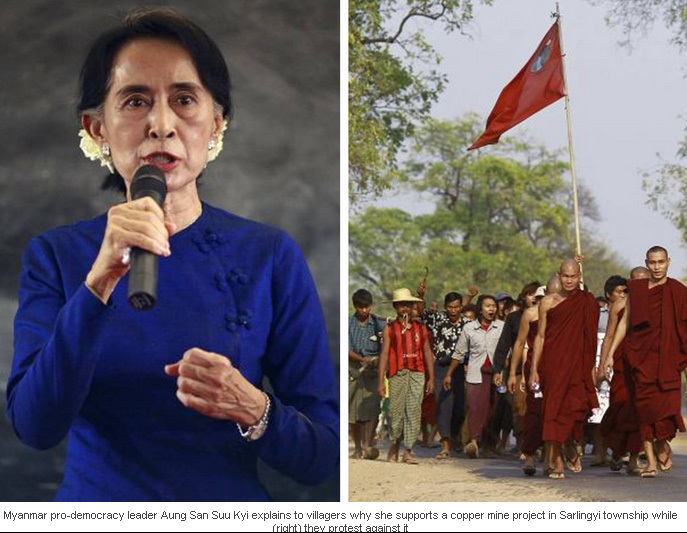 Burmese democracy leader Aung San Suu Kyi – at the centre of mounting controversy after recommending a controversial $1bn copper mine be allowed to continue operations – today visited the Chinese-backed project and urged villagers to accept it. On a visit to the Letpadaung mine, 450 miles north of Rangoon, the Nobel laureate said that if the mine was not permitted to continue working and to expand, both the local and national economies would be damaged. The National League for Democracy leader has found herself at the centre of anger and frustration after the publication earlier this week of a report by a parliamentary panel she headed. The report recommended that the mine should continue to operate and failed to punish police who had injured protesters in a crackdown. The investigation was established last November after dozens of Buddhist monks and other campaigners were injured when police used water cannon and smoke canisters to halt protests at the Letpadaung mine. The project, the largest in the country, is operated jointly between China North Industries Corp, a weapons manufacturer, and a subsidiary of the Burmese military. Villagers and other protesters had opposed an expansion of the mine, saying the move would take away 8,000 acres of land, leaving large numbers of people homeless and would do widespread environmental damage. The site was for month occupied by villagers and protesters. But in late November last year, the authorities dispatched police to clear the campaigners. They did so using water cannons and smoke shells that contained phosphorous. Dozens of protesters suffered serious burns as a result. Amid widespread condemnation of the crackdown, the government of President Thein Sein asked Ms Suu Kyi to head a panel to investigate what had happened and to make recommendations. Yet the panel’s suggestions, reported in state-owned Burmese language newspapers, have already sparked more controversy. While the report confirms that phosphorous-based smoke munitions were fired at protesters – something initially denied by the Burmese government – it does not recommend any punishment for the police. More significantly it suggests that the mine expansion should be allowed to proceed. The report makes this recommendation despite noting the likely environmental damage that will follow and the fact that it will create few jobs for local people. Rather, it does so on the basis that scrapping the expansion could add to tension with China, an important strategic partner. It says local people should be adequately compensated for land that was taken rom them in 2010 when the mine project started and for any more lost in the expansion. The rallies at Letpadaung and the crackdown on them were widely seen as an indication that the rights of citizens to protest government policies remain limited in Burma, despite a series of democratic reforms enacted by Thein Sein. The role of Ms Suu Kyi has also highlighted the compromises she has been obliged to make since entering mainstream politics and being elected to the parliament last spring. David Mathieson of Human Rights Watch said today it was a positive step that the report had been released and indicated the government recognised land grabs had become an issue in the country. Yet he believed it could have set a higher standard for holding to account the police, who responded with violence.